Saying that I love to travel is an understatement. I’ve lived in San Francisco, Los Angeles, and Boston, and I can attest to the fact that each city has its own amazing, unique qualities that make them special. When I was younger, my mother was a teacher and got summers off, so we would travel to Mexico or Hawaii every summer. It was a treat to live along tropical beaches and slip into new customs, sights, foods, and languages. Since moving to the East Coast, I’ve visited NYC a few times which is always such an adventure, as well as the seaside foodie town Portland, Maine. This past weekend was so fun because we ventured a little further – to Montreal in Quebec, Canada! 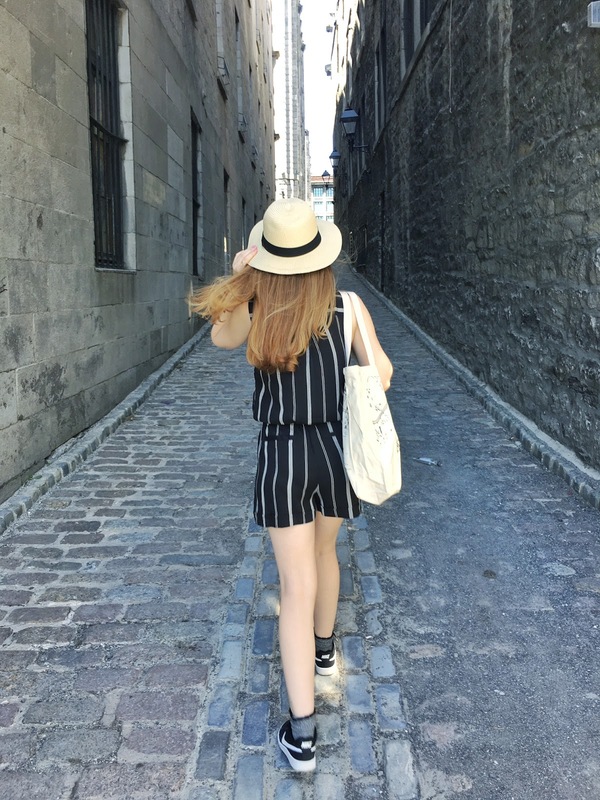 This was my first time to Montreal and even to Canada, so it was a real adventure bopping around, finding the best restaurants, seeing the sights, and just exploring a new city. I hope you enjoy this weekend travel guide to Montreal, and stay tuned for more in-depth reviews of the below venues soon! Montreal is a hip, French-speaking city in Quebec, Canada. With everyone speaking French (they’re also fluent in English), it felt a lot more like the charm of Europe than Canada, with the exception of the Tim Horton’s and everything being in Canadian dollars. You need a passport to get back into the states, as well as an international plan for your stay there (mine was $10/day). The weather reminded me of a slightly warmer SF. It seems to rain quite a bit and goes from hot to cold and back again throughout the day, so it’s a good idea to bring light jackets that you can carry around with you. It was about a 6 hour drive from Boston, and just a 4.5 hour drive back to Boston around 4:30-5 PM on a Sunday. L’Hotel Germain in downtown Montreal is any traveler’s dream hotel. The concierge Andre provides truly amazing restaurant recommendations, the staff hands you water and umbrellas as needed as you walk out the front door, complimentary car service takes you across town in a pinch, and there is no checkout time! That’s right, no more rushing to leave your hotel by 10 AM just to drag your heavy luggage around town. We got to spend our last day out on the town without a care, with our luggage safely back in the hotel until our return. 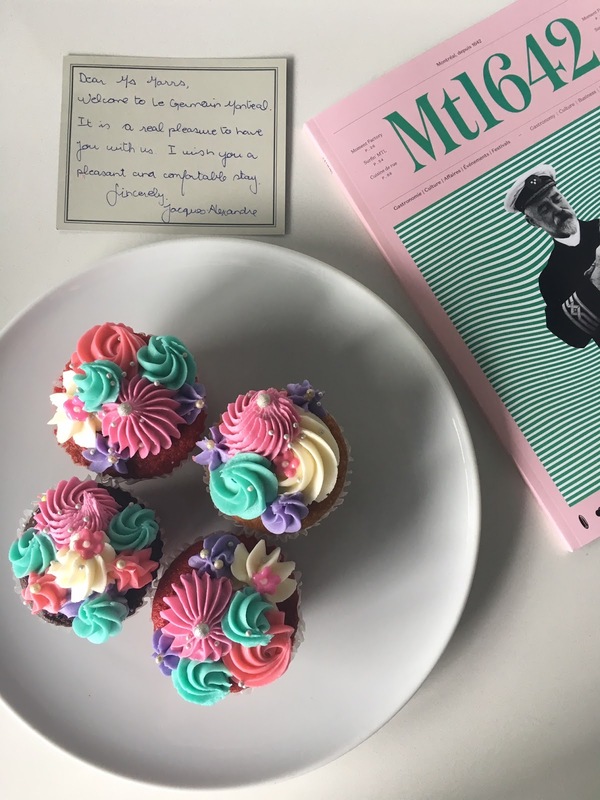 They even had these gorgeous cupcakes waiting for us in our room upon our arrival, and restocked our room with gluten-free treats when they heard I was gluten-free! Talk about going the extra mile. They also had top of the line shampoo, conditioner, and body wash in the shower which is unheard of in most hotels. Plus, it’s in the heart of downtown Montreal, just a few blocks from the main shopping strip and fabulous restaurants. The comfiest couch in L’Hotel Germain lobby. Fluffy robes and fabulous views. Literally the comfiest bed ever! Add in complimentary magazines, cupcakes and espresso, and that’s the perfect morning! Front outdoor patio – I didn’t want to leave! From the impeccable service, to the amenities and location, I cannot recommend L’Hotel Germain enough! Montreal has a lot of great cafes, restaurants and nightlife. Below are the places we tried and loved for their food, ambiance, or both. I highly recommend them! This two-story café in Old Montreal is so cute and relaxing. I would go here all the time if I lived here! They have pretty, healthy dishes like the pink quinoa bowl and gazpacho soup, and are well-known for their epic avocado toast! Everyone was very friendly here, and we ended up chatting to a few neighboring tables with ease. A recommendation of our concierge Andre, LOV is a picturesque café with a full menu which boasts plenty of gluten-free and vegan options. Their Instagram-worthy décor includes swings, white exposed brick, and a rustic sink set on top of a bicycle. The food itself is gorgeous as well as delicious. 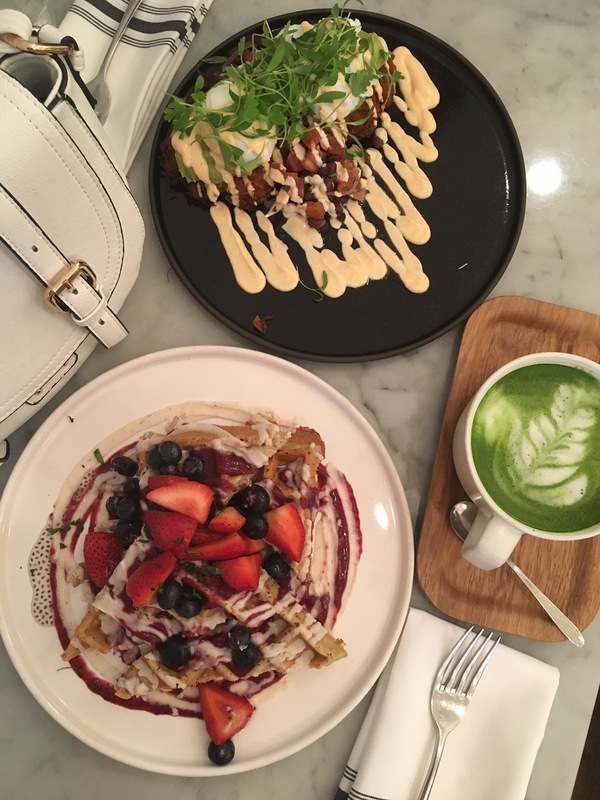 We got the hemp waffle (I was skeptical based on the phrase, but it was seriously delicious and gluten-free), as well as the scrumptious eggs benny which comes on avocado and rosti, and of course an almond matcha latte. Another Andre suggestion, Spanel is an amazing venue which specializes in buckwheat crepes. I used to think that I didn’t like buckwheat until coming here. They’re gluten-free and have such an amazing selection of ingredients! We ordered one with scrambled eggs, avocado, chorizo, spinach and cheddar, and another with duck confit and duck fat potatoes. They were definitely the best crepes we’ve ever had and one of the top all-time meals! Loved their outdoor patio too! This French-Peruvian fusion restaurant is great for a swanky dinner and walking distance from L’Hotel Germain. They have a great prix fixe menu starting at 10 PM for just $28 which is an amazing price for the food, service and ambiance here. Due to an unpleasant encounter with another patron, we actually got our meal comped and saw firsthand the spectacular level of service here. 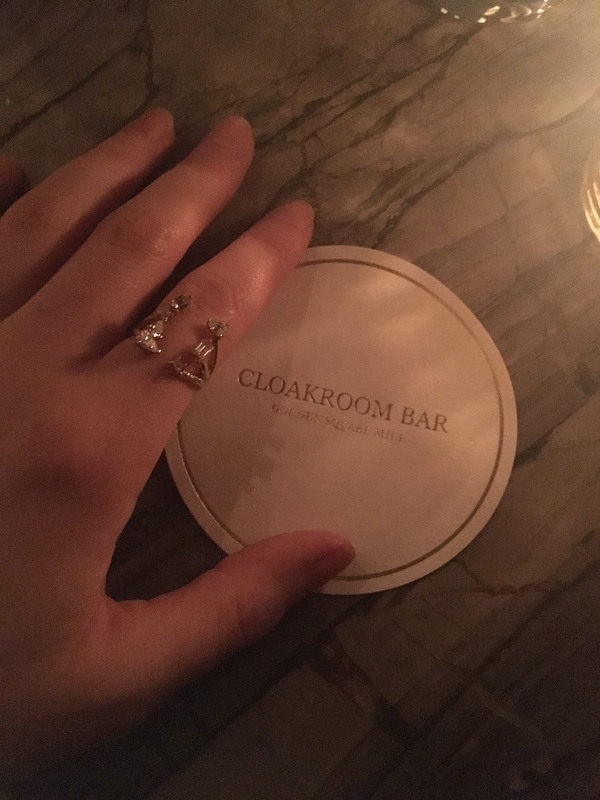 Few things in life are cooler than a French speakeasy. Andre suggested this venue, which has no sign outside or inside. You simply walk in and wait in an empty room, and eventually someone opens a nearby wall and lets you in! There is no menu, you just tell them what you like and they expertly craft a cocktail based on your preferences. It reminded me of Drink in Boston, only cooler because of the French. 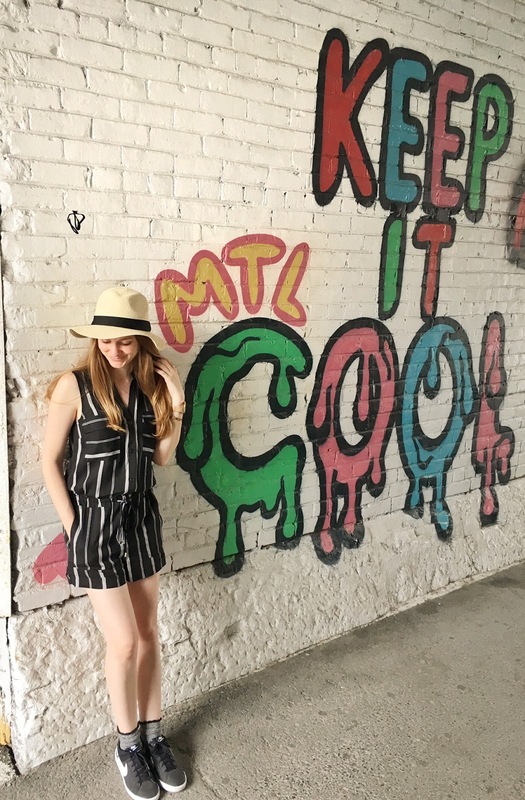 Though you could spend all weekend just going from one phenomenal restaurant to another, there are plenty of sights to see in Montreal as well – check out my full Montreal Activities post here! It took us maybe 15-20 minutes to walk all the way up to the summit. It was a bit of a workout but one you can do in casual clothes. At the top you have an amazing view of the entire skyline that makes it worth the trek. There was also a piano player that made it feel extra special. From the summit of Mont Royal you can hike back down the back side of the mountain and come out in the Plateau neighborhood (Google maps has the trails laid out to get there, super easy). Plateau reminded me so much of Haight Street in San Francisco, with tons of great street art, boutiques, bars and restaurants. It has a bit of a more local, gritty punk scene which is fun. Old Montreal is filled with cobblestone streets, cute cafes and boutiques. It’s very cute, and has slightly more of a touristy and European feel than Plateau does. They’re both great in different ways. We also checked out Bonsecours Market while we were here, but I would skip that – it was pretty touristy. Marche Atwater (below) is a fuller spot that the locals go to between Little Burgundy and St. Henri. Atwater Market is a bustling local farmer’s market with a lot of soul. Come here for booth upon booth of fresh flowers, produce, local food stalls and desserts. 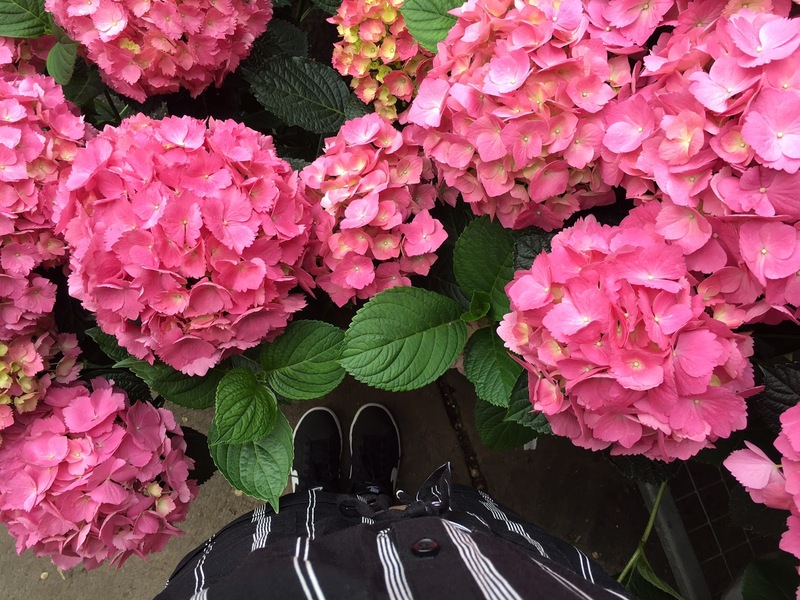 We grabbed some fruit for the ride home and I got lost in a booth full of hydrangeas! On the way to Old Montreal (and near Tommy Café) is the epic Notre Dame. It’s an impressive historic site with even more gorgeous interiors. Between the beautiful French language, scrumptious restaurants, shopping, hiking, views, and culture, Montreal is a must-see for any wanderlust like myself. I definitely recommend a visit to this city, which may be the closest to Europe we have in North America, and specifically staying in L’Hotel Germain for a home away from home. Check back for in-depth posts on many of the above Montreal restaurants and activities! Comment Challenge: Have you been to Montreal? What was your favorite part of your stay?